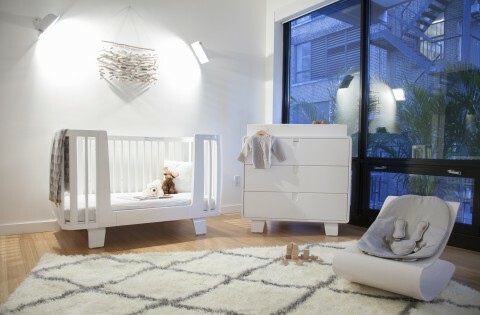 If you’re looking for something really different and unique (and understand that the price will reflect that), the nursery pieces from Bunny & Clyde may be what you’ve been looking for. Coming to you from Ireland, these handcrafted pieces are made of solid wood. 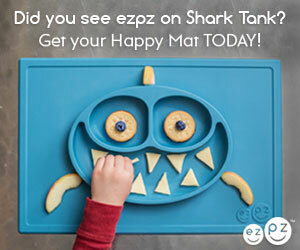 Using natural materials, each piece is unique, non-toxic and FSC certified. The incredible Harrison Nursery Set is unlike anything you’ve seen before. With a mid-century modern inspiration, you can choose the European Ash version or the duotone Ash/Walnut combination shown below. I’m crazy about the rounded opening of the sides and the amazing v-shaped legs. 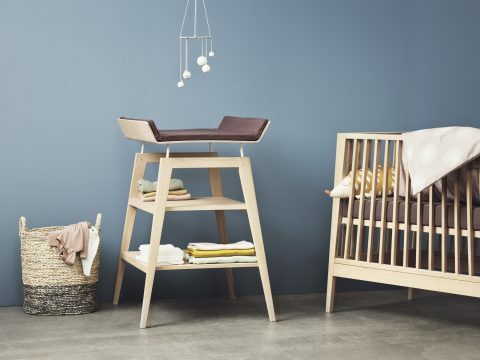 The Coco Nursery Set features beautiful European Ash with a painted base and box to contrast with the natural grain of the wood. 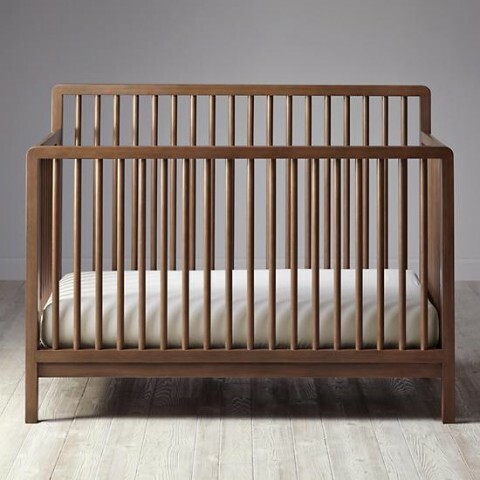 The geometric detailing on the sides really makes the Coco Crib something very special. 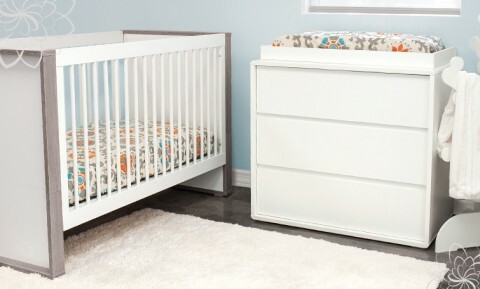 You can order the cribs (cot) and dressers (station) separately. 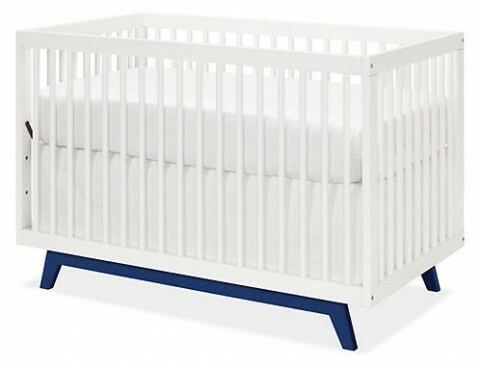 With additional accessories, both the Harrison and Coco cribs are designed to last by converting to attractive toddler beds and day beds as well. 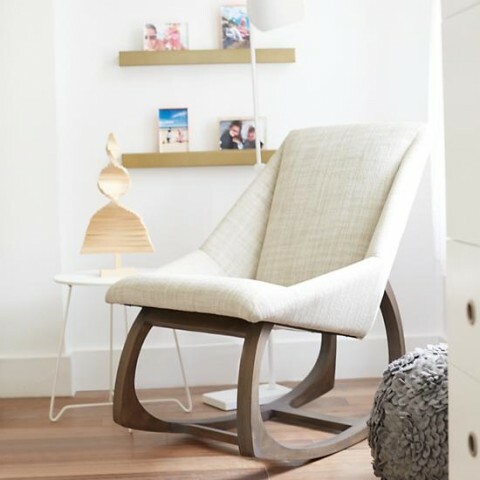 The Rosaline Rocking Chair is designed to work beautifully with either nursery collection. You can select from ten different fabric options. For shipping to the US on these nursery pieces, you do need to contact the company ahead of time and get the cost. If you like Bunny & Clyde, you may also like Kalon Studios. The Coco Crib reminds me a bit of the Io Crib. 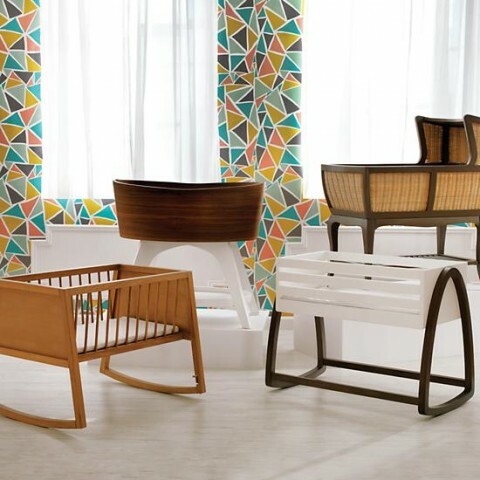 From Tulip Juvenile, I want to introduce you to the modern Linea Nursery Collection. This canopy accessory may also be available. The angled sides of this collection are what really set it apart. Love! Nursery Works continues to elevate the modern nursery to the level of art and sculpture. 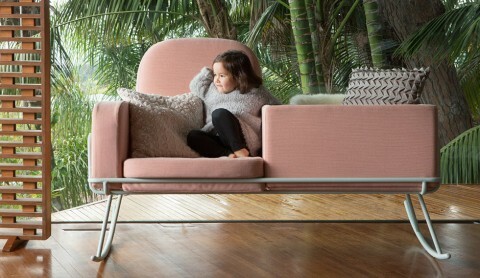 If you’re looking for something extraordinary, they are providing a unique vision in the world of modern nursery furnishings. Three new designs have just debuted in their collection and I’d love to show them to you. 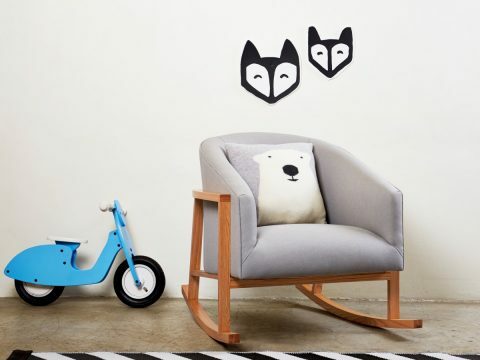 First, designed by Chelsea Park, the Ami Rocker is bold design with rounded wool cushions on a tubular steel frame that transforms from a rocker and bassinet into a double seat rocker. It comes in this pink color they’re calling “Red” and retails for $1250. The perfect paring with the Ami Rocker is the Margaux Dresser, also a Chelsea Park design. It has the same tubular steel frame and features push drawers and a granite top. This retails for $4500. I look forward to seeing this one in person! The Ballad Rocker, designed by Matthew Grayson, is a whimsical rocker with a twisted steel frame and a comfortable wide seat and seat back. It retails for $2200. You can see it in the space above as well. How can you not be impressed with what they’ve got going on here? Keep it up, Nursery Works! 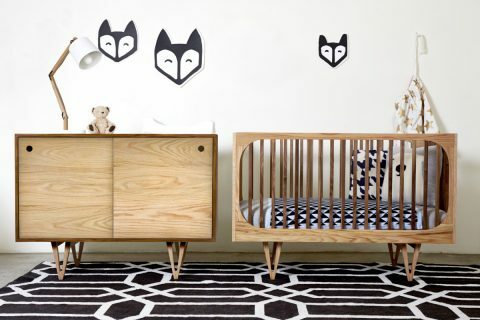 With P’kolino’s new customizable nursery pieces, the possibilities are literally endless. They have just introduced three nursery furniture collections as well as bedding and wallpaper. My favorite new items are the Luce Collection. 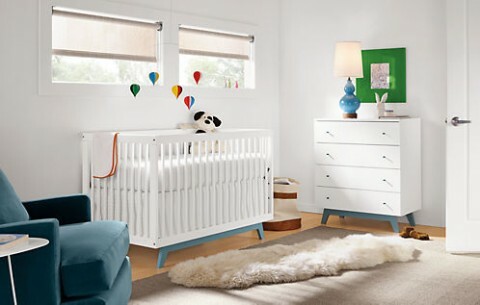 As with all the P’kolino nursery furniture items, there are different panel color and pattern options. You can even upload your own artwork to truly make it your own. 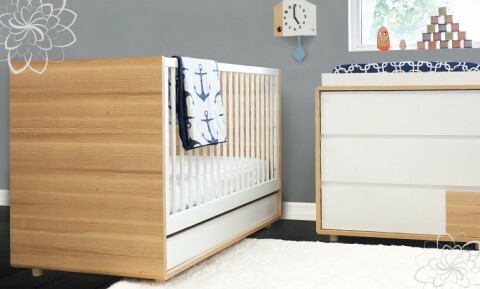 The Luce Convertible crib transforms into a lovely toddler bed with no additional pieces to order and the Luce Dresser features up to two customizable drawers. The second P’kolino collection is Bianco. It looks lovely in all white, but the side panels and drawer fronts can be customized. 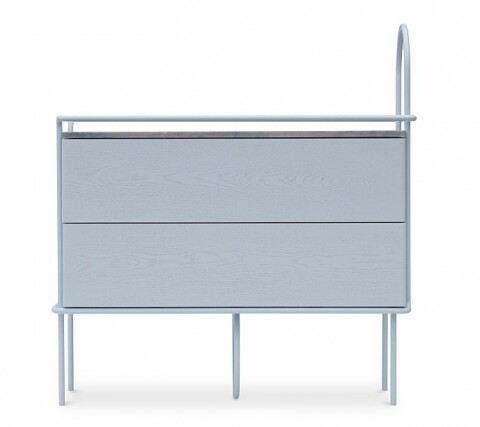 The matching P’kolino Dresser features up to three customizable dresser fronts. 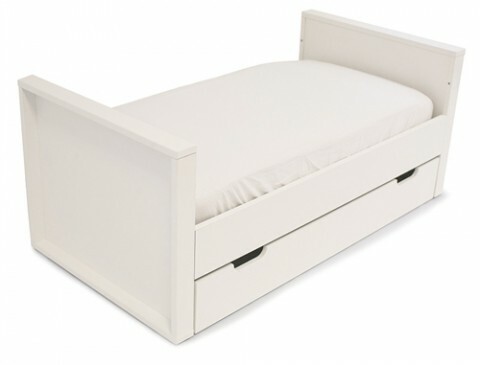 The crib converts to a toddler bed which is shown below with the optional crib drawer accessory. 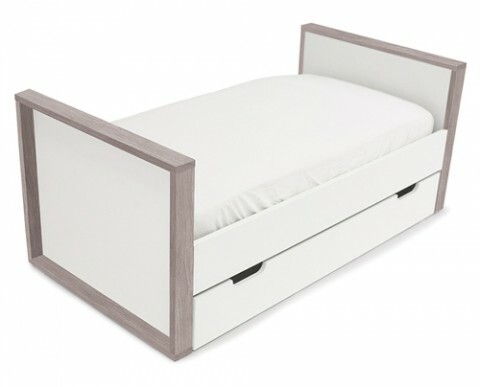 The third crib is Grigio which also has customizable panels and converts into a toddler bed. The bedding collections coordinate with the colors and patterns, and removable tempaper tots wallpaper finishes off the look. 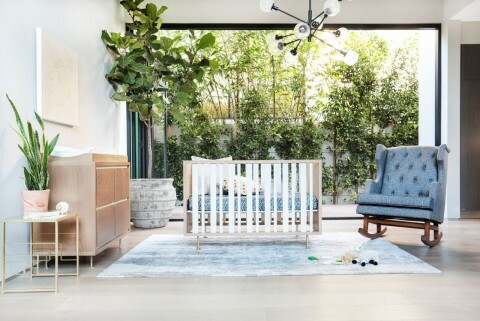 These are exciting additions to the modern nursery world and with cribs starting at $500, they’re worth considering for your baby’s space. After debuting several new cribs last year, I didn’t expect to see anything else from Nursery Works for a while, so I was super excited to learn about the Novella Crib and Dresser. 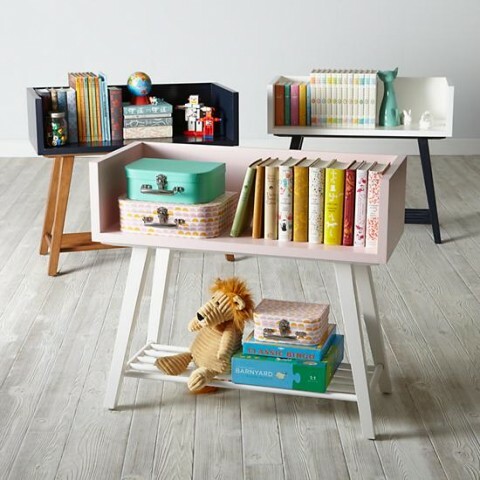 converts into a toddler bed and then a stylish reading nook! 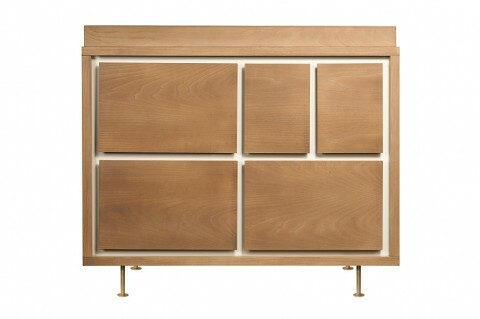 The matching Novella Dresser features an asymmetrical 5 drawer pattern. $1400 I’m looking forward to checking these out in person soon! You can pre-order yours starting 6/15. 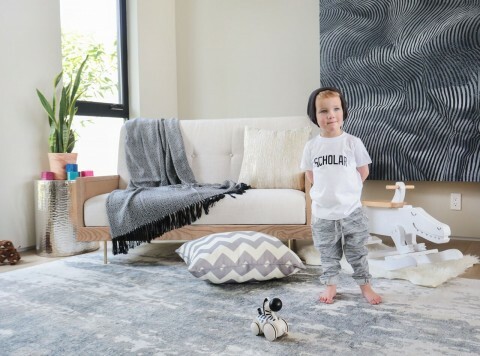 There are a few eye-popping new offerings from The Land of Nod. We’ve been waiting for this Spring 2015 collection since we saw previews of it on Instagram, and I’m just as excited about it now that I’m seeing all the pieces individually. First and most notable is the Springwood collection. Designed by Maria Yee, each piece in the collection is handmade from bamboo and coated with a water-based finish. The Springwood Rocking Chair is a unique, sculptural piece that adds a lot of style without taking up too much floor space. Of course there’s a matching dresser ($1200) and changing top ($200). 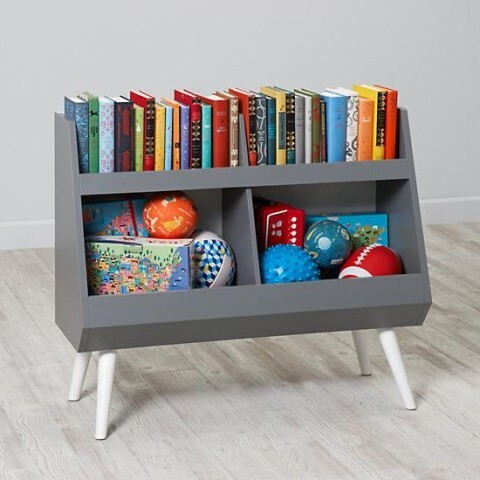 While the legs are beautiful, if you’re looking for a lot of storage, you might want to find another option. 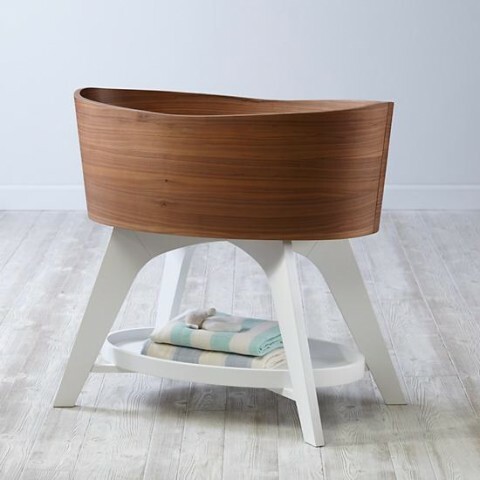 The Land of Nod has really gone all out with bassinets this year and one might have to move from your “optional” list to your list of must-haves for baby! … and most spectacularly, the Norse Bassinet. 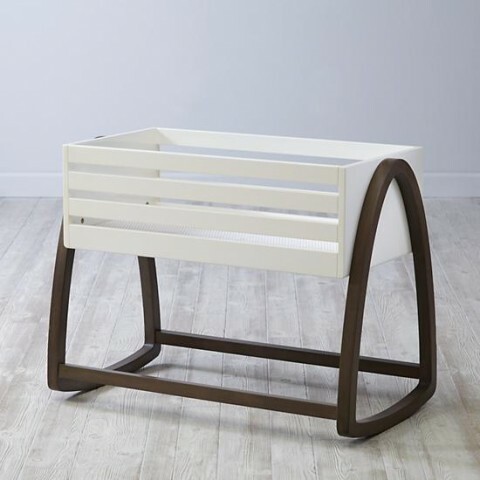 This Scandinavian-inspired design is one of my favorite new baby furniture pieces in a long time. Other baby furniture brands are really going to have to start stepping it up in the design department! 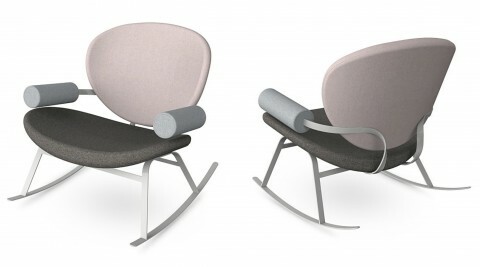 The Campo Recliner from Monte Design is a Nod exclusive. 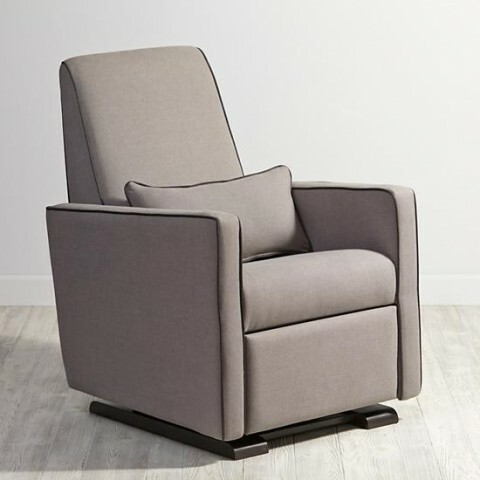 Similar to Monte’s Grano Glider Recliner, the Campo Recliner comes in light or dark gray and features contrasting piping. What new pieces are going on your wishlist? I’m a believer that when it comes to furniture, you really can’t go wrong with the quality and service from Room & Board. 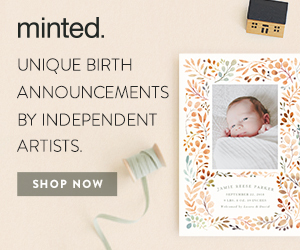 So you know I get excited when they debut a new nursery collection. 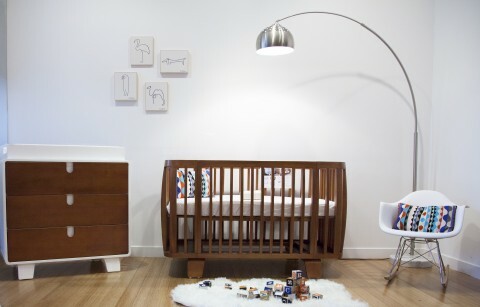 For 2015, Room & Board has the new Flynn Crib and Flynn Dressers as well as the Colton Swivel Glider. 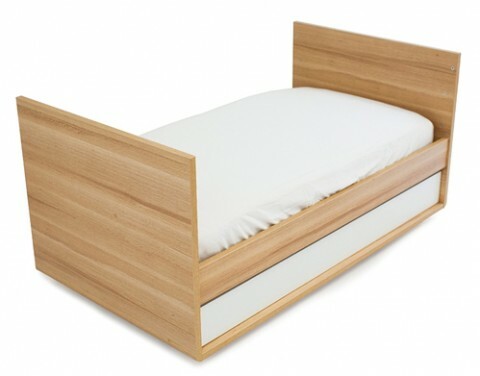 The Flynn Crib comes stocked in Walnut or Ocean (shown above). You can also special order one of 10 different base colors. 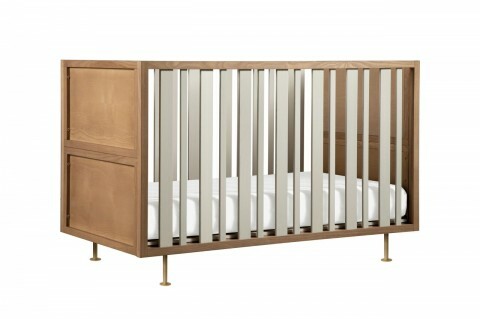 The crib retails for $800 except the Walnut base version which is $900. 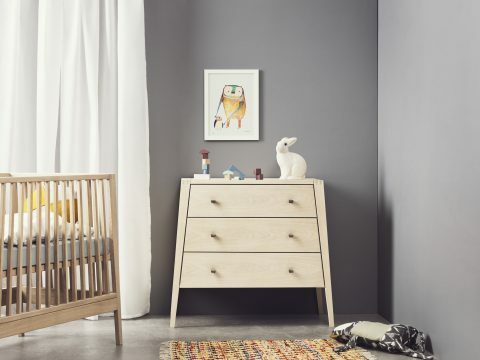 The Flynn Dresser comes in a 6 drawer ($1200) and 4 drawer ($800) version with the same color options as the crib. 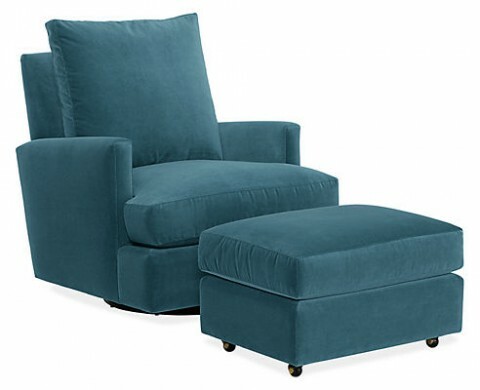 The Colton Swivel Glider is available in boucle and velvet fabrics and retails for $800 to $900 depending on the fabrics. 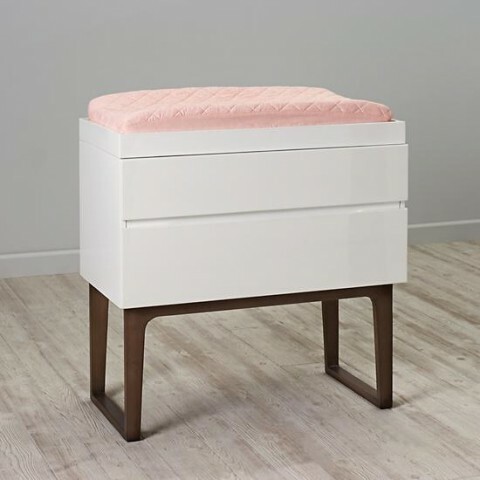 A matching ottoman is available for $400 to $450. 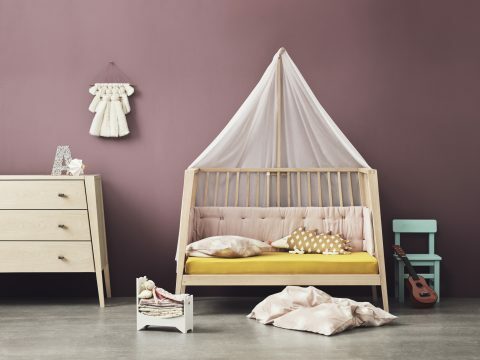 You really can’t go wrong with one of each, and your nursery can be totally unique with your color choices. 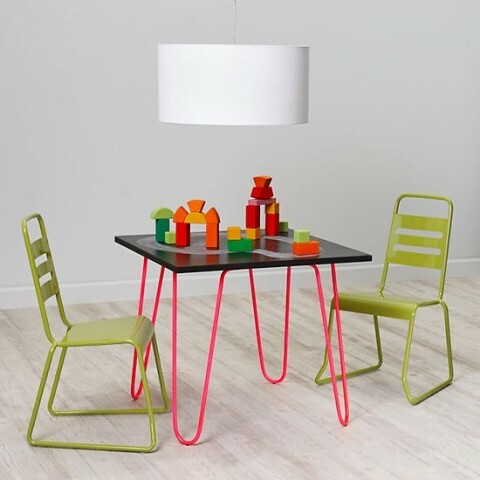 They call it retro, but it’s really a unique new modern crib with a fresh style for 2014. These are the kind of curves I like on a crib. No sleighs, no arches, just a slightly rounded shape that softens the modern style just a smidgen. 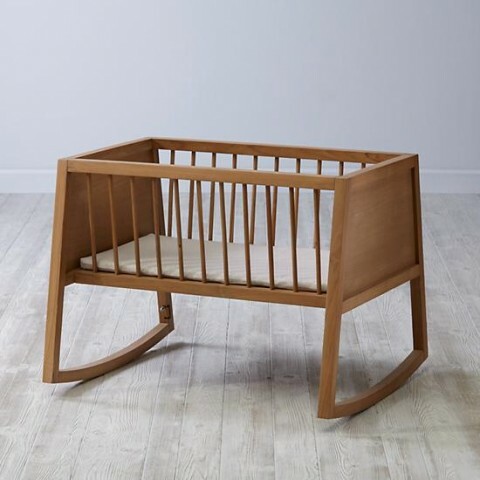 From Bloom, the Retro Crib is a solid wood crib “inspired by mid-century design.” It is available in Coconut White as well as Oak. The matching Retro Dresser comes with a white frame and your choice of Coconut White, Frost Grey or Oak drawer fronts. The crib can be converted to a toddler bed with the Retro Bed Rail. Both the crib and the dresser are available right now and retail for $1200 each. 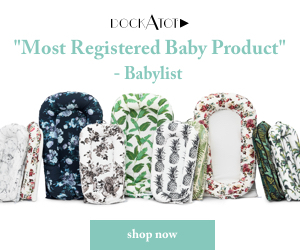 In case you’ve got to have this collection, feel free to order yours through our giggle affiliate links.